The Circular Vest is crocheted in the round as one piece (no sewing required). 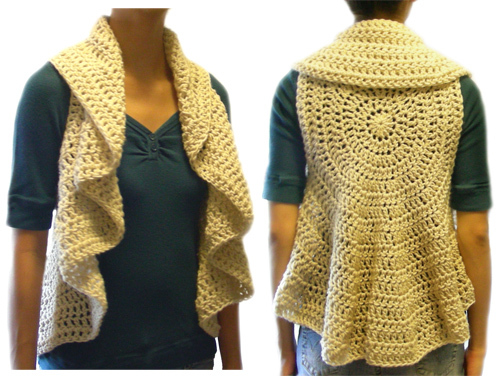 It’s crocheted with a large crochet hook to give it a loose drape while still providing warmth. Best of all, this vest works up really quick! Personalize this cardigan styled vest by adding buttons or a belt. All purchases help to support Crochet Spot and are greatly appreciated! Need help while crocheting your circular vest? Just let me know and I’ll help! This entry was posted on Sunday, September 26th, 2010 at 11:50 AM by Rachel Choi	and is filed under Best Crochet Patterns. You can follow any responses to this entry through the RSS 2.0 feed. You can leave a response, or trackback from your own site. You have inspired and give me confidence with my crocheting! I’m going to actually make something to wear. Thanks again for all your great patterns. So cool! And it fits with the fall trend of longer draped garments. It is beautiful! Rachel, you are a genius! I have a counting question. Do I count the ch 3 or ch 2 in each round as the first stitch so that for round 1, I would actually only do 11 dc to make 12, or do I dc 12 and the ch3 makes 13? Hi Ester, the chains are not counted as double crochets unless specified in the pattern. So if the stitch count is 12 double crochets, then you are literally making 12 double crochets, not 11. (This also goes for any pattern on Crochet Spot) Let me know if you need more help. Hi Debra, it’s all about the way you wear it. To style the ruffles, you can lay more of the fabric from the circle towards the front. You can even make the circle larger by continuing with the pattern if you think you need more fabric to drape down. Feel free to try it out and play around with it to make different looks! I love this vest–the first time I wore it, I got gobs of compliments. Thanks for a great pattern! I’m trying out this pattern at the moment. Just started on the back. This is a GREAT pattern!!! It’s quick, easy to make, and looks great even when it’s made with the lesser expensive yarn (e.g., Red Heart). Let me know if you need more help with it! I would like to buy the Crochet Pattern: Circular Vest, but can’t find it in the store, how do I go about buying it???? Hello! You can use the orange log in box on the store page, since you already have a store account. Once you are logged in you can add the pattern to your cart and check out. If you need more help with it, feel free to email me at [email protected] and I can help you further! I need to make this in a medium, but the N hook, is making too large. I’m wondering if I use a K hook & use the large pattern if that would be compatible?? Hi Gwen, try checking the gauge using the new hook size. If you match the gauge, then the size will match too. Round 12 instruction scare 2 DC in next DC, DC in each of the next 10, around. Round 12 for 3X, 4X, & 5X, gives instructions for the armhole. I’m real confused, I know I’m missing something. Thanks!!! You can download the pattern by going back to the store ( http://www.crochetspot.com/store/ ) and logging into your account if you aren’t already logged in. Then clicking on the “My Purchased Patterns” tab at the top of the page. If you don’t see the tab, try refreshing the page. If you need more help with it, please email me at [email protected] and I can try and email you the pattern instead. I would love to purchase this pattern, but I do not see where I can add it to my cart. Your help is greatly appreciated, thanks! Never mind, I was able to add it to my cart and download it. Thank you so much! I went to the crochet spot and made an account but I cannot find the pattern. Is there a direct link to this pattern? I can’t find a search button either. It can be purchased from there. Let me know if you need more help with it!